Today was a sad day in our home. Our Chilli died today. He was part of our family for 15 years. He'd been sick for a while now due to a tumour growing in his snout. Even so he was still happy and enjoying life, some days he could still dart about like a pup and other days he was a little slower on his feet. Overnight his condition rapidly deteriorated so when we took him to the vet today, we had no option but to put him to sleep. We all got to have a last pat and say goodbye. 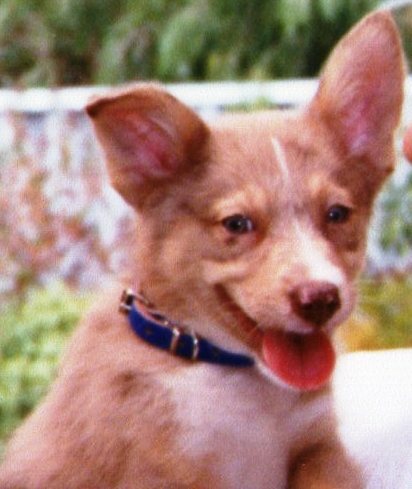 Here is a happy memory, the very first photo we took of him when we brought him home as a puppy. With a cute face like that it is no wonder he managed to wriggle into our hearts. We'll miss you Chillibilli boy. Oh, dear Rebecca and family - I'm so sorry for your loss. Please accept the condolences of another pet person who can understand the sadness and loss. God bless this little boy, that was a true friend for you and your family,I wish you to remember only happy moments you past with him,life goes in this way.I know because I had a dog, sweet dog, like a daughter for me and now she is in heaven.